Some companies run their Sales & Operations Planning (S&OP) with great effectiveness. However, too often S&OP maturity and performance stalls, even when the supporting S&OP processes and systems are properly implemented. S&OP culture and leadership has often been proposed as a mechanism to improve S&OP performance. More specifically, Tuomikangas and Kaipia (2014) suggest that this includes “the organizational mind-set and practices that facilitate and advance formal planning.” To win with S&OP, you clearly need a wining organizational mindset. Performance psychologist and practitioner Jim Loehr called the mind-set of the winner Mental Toughness, a concept that has been successfully used in elite sport coaching for the last 30 years. Mentally tough individuals and teams have the mindset to perform at the best of their abilities, regardless the circumstances. Through his research, Professor Peter Clough found four attributes that make up Mental Toughness; Commitment (“I promise to do it”), Control (“I really believe I can do it”), Challenge (“I’m driven to do it”) and Confidence (“I believe I have the ability to do it”), also called the 4 Cs. 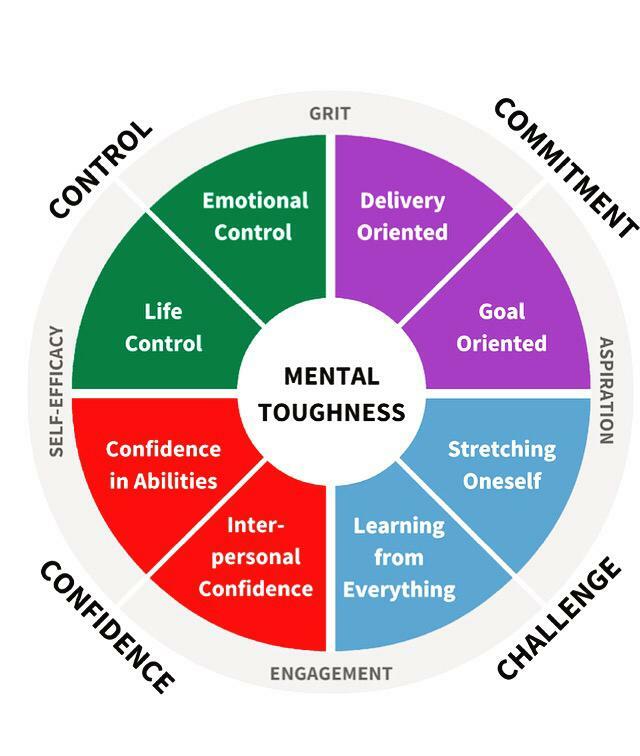 Clough took mental toughness out of the elite sport environment in to our every day and business life and developed a framework to measure and develop a winning mindset for individuals and teams. S&OP can only be effective and sustainable when it is supported by the right mindset and behaviours. Individuals and teams with a superior mindset will increase S&OP effectiveness and are proven to perform better and show increased well-being. However, it is unlikely that there is a critical mass of these behaviours in every company that implements S&OP. Together with Supply Chain Movement, I put together a 10-question checklist, related to the 4Cs, to assess the mindset in an organisation. Based on the checklist we developed a survey to assess the S&OP mindset across companies. We had 52 responses across our S&OP mindset survey and share some key insights. Only 25% of survey participants answered yes to the question ‘We have a relentless focus on only what is important for long term business objectives’. This indicates a lack of focus and commitment on one of the main objectives of S&OP, long term business planning. Short term business issues still get in the way of maturing S&OP and using it for valuable long-term planning elements like portfolio management, rolling budgeting or strategy deployment. Positive individuals are proven to perform better and are healthier than negative individuals. 77% of participants answers yes to the question; ‘Even in challenging situations or during setbacks, we always keep a positive outlook.’ The survey participant indicate that their companies retain a positive and healthy mindset, even during setbacks. Companies with a positive mindset often see opportunities, rather than threats and are open to adopt to their environment. Open challenge and discussion of critical topics is a sign of a psychological safe group environment, where people don’t feel threatened to speak up. These environments improve the decision-making process, team effectiveness and even employee well-being. 73% of participants answers yes to the question; ‘Team members openly challenge each other and put critical topics on the table.’, which indicates a healthy S&OP group environment in most companies. 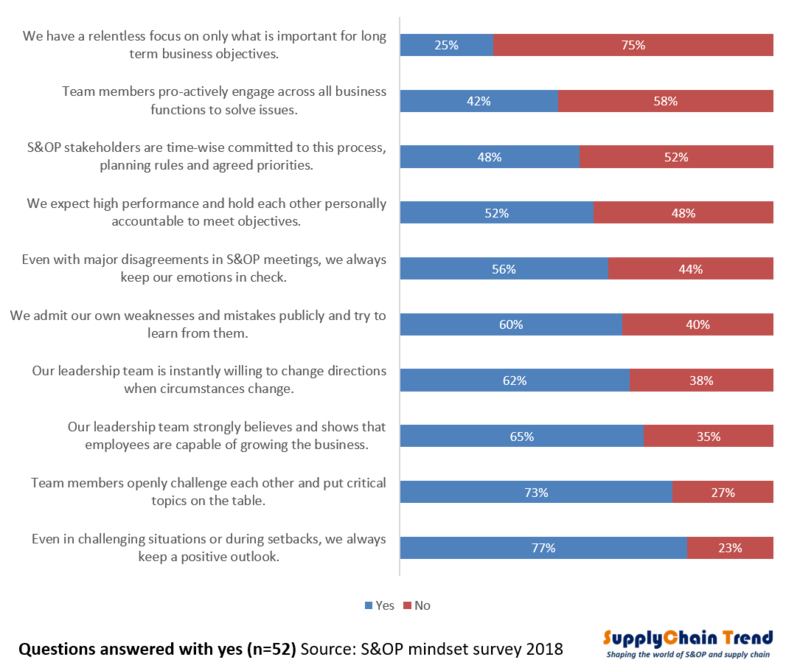 Although open challenge is part of the average S&OP mindset, only 42% of survey participants answer yes to the question; ‘Team members pro-actively engage across all business functions to solve issues.’ To address business issues with their peers across silos, individuals require interpersonal confidence and have to believe they can make a difference. The results indicate that more than half the companies are static and re-active in crossing business silos. This will reduce agility and response times within the business. Find below a graphical representation of the results for all 10 questions, for which I called out the top and bottom two. In my next blog, I’ll discuss some further insights. I will go in to detail on the differences in mindset between self proclaimed effective and inffective S&OP processes. In the mean time, feel free to join the conversation and leave a comment.